Out of all of those I found cycling the most intimidating. Simply because before we’ve even set off I feel I stand out as a novice, next to my rusty-chained commuter and wearing miscellaneous pieces of old sports kit, I quite clearly have neither the gear, nor the idea! It is therefore exactly that ‘nervous, novice cyclist’ that you find outside E5 Bakehouse on a Saturday morning, glancing around anxiously, trying to spot other ‘non-cleated’ riders and frantically readjusting my saddle bag as I’ve somehow attached it to the wrong part of my bike. Once our group have identified themselves, we begin to divide into three different abilities, a slow, medium and fast peloton (yet another source of panic). I go for a safe medium but how fast exactly is 22kph?! But as soon as we start to roll out of Hackney I begin to realise I needn’t have worried and the anxieties drop away. We ride two abreast (side by side), which means you have plenty of chance to get to know your fellow cyclists, and almost immediately everyone is swapping stories with their neighbours of their triathlon experiences so far. 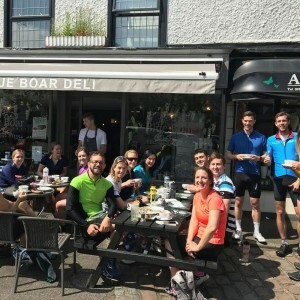 The group is such a mix of people, from former cyclists recovering from injuries, complete newbies, right on to more veteran club members looking to meet new athletes and share their enthusiasm. 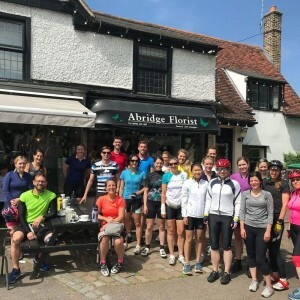 The chat lulls as we break out of the London traffic into the Essex countryside, at its best in the morning sunshine, as we cycle steadily through dappled forest corridors, rolling farmland and the quaintest of little English villages. There are even a couple of hills (down south, who knew!?) and everyone takes these at their own pace, but regrouping at the top whilst we all take the chance to rehydrate and catch our breath. The pace is kept such that no one gets left behind, and those feeling bold can sail to the front and lead for a bit, listening out to the group leader – proud holder of the club garmin – for directions and warnings. It is therefore a very happy, if a little sweaty, group of cyclists that roll into an Abridge cafe about halfway through, chatting over coffee and cake, already organising future rides and posing for the [obligatory] group photo. The great thing about LFTC creating these more accessible opportunities for ‘first timers’ is that by doing something that you thought was a little out of your reach, you gain so much more confidence to tackle your next challenge. 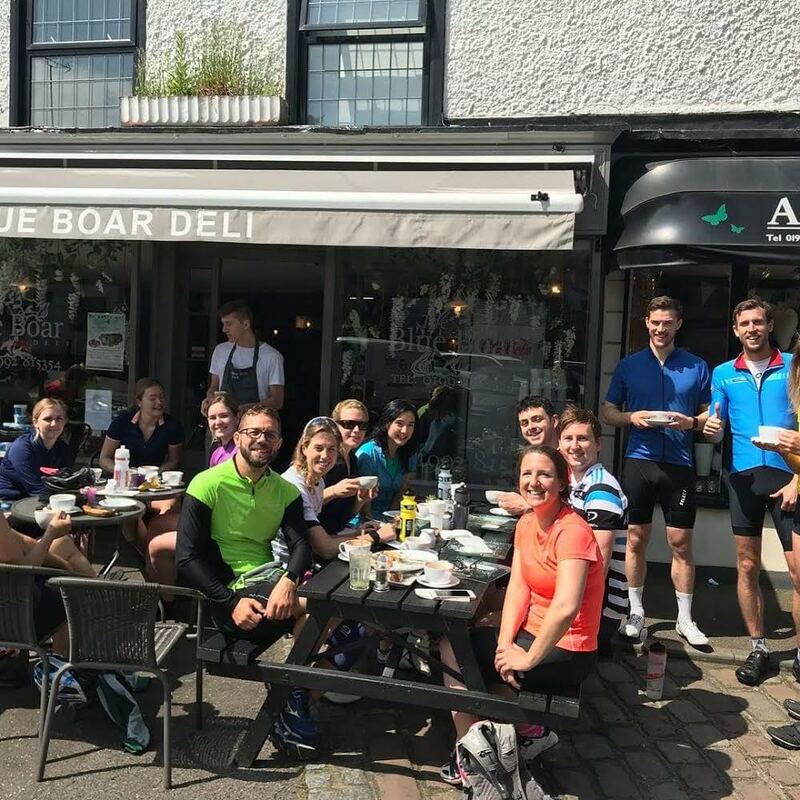 It’s impossible not to feed off the enthusiasm and experience of fellow riders – you very quickly realise that you’re not the only one with the same fears and ultimately get all the advice and encouragement you need to tick another goal off the list. So the next weekend saw me once again outside the bakehouse at 7am (yes, 7am!). This time I was definitely the only one without cleats, and we were going further and faster, but I felt up to the challenge after the satisfaction of completing last week’s ride and the same atmosphere of support prevailed. Andreia and Sabrina were much more experienced than me – though it was the first time for Andreia riding so far as well – and whilst they maintained a good pace, and chat was sparser than before, the ride was still enjoyable! In the last two kms before our coffee stop halfway through (apart from a moment of glory where I managed to peel AND eat a banana without dropping) my head had been occupied by the creeping ache in my calves and the inevitable saddle sores that not even Decathlon’s finest padding could keep away. That being said, when asked how I was doing, I still managed to confidently say, ‘good, but I’m working hard’ which was met with an equally honest, ‘good. You should be!’ – some fine words of encouragement there…! And so when we set out on the second half of the ride, which felt a little tougher, we supported each other, congratulated ourselves at the top of each hill and I enjoyed the thrill and confidence that came with stepping out of my comfort zone. I leaned a little further forward on the downhills, pushed a little harder on each incline, tried my best to ignore the saddle discomfort and truly relished my fry up when I finally got home (after spending the last hour of the ride debating how I would eventually cook my eggs). I guess all of the above has now made me a convert. That annoying person encouraging all my friends to just ‘go and do it!’, be it buying a bike, joining a beginners ride or signing up for the BallBuster Duathlon, which has been spoken about for weeks. I’m planning a long cycle ride for my birthday and definitely buying some cleats, maybe even arm warmers too! My saddlebag is probably still on the wrong way, but what the heck, my malt loaf hasn’t hit the tarmac yet! Our Club are doing Awesome Events for Charity – Read Their Stories!